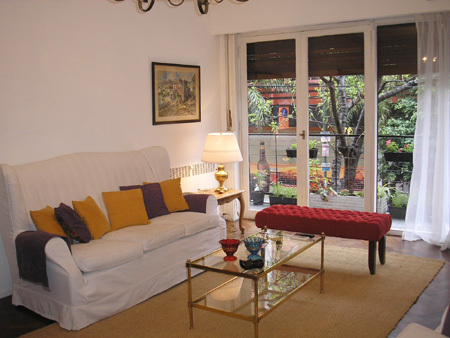 This beautiful and elegant apartment is situated in the residential area of Palermo, close to the Bottanical Gardens the City Zoo and all the parks of Palermo. There are scores of bars and restaurants all within easy walking distance. It is beautifully decorated with a large living room and three bedrooms, the main bedroom has a double bed, the second has two singles and the 3rd bedroom has a single bed. It has a fully equipped kitchen and the bathroom is complete with a shower and a bath. Balcony to the street, an internal patio, wooden floors, cable TV, air conditioning, fridge freezer, gas cooker, microwave, coffee machine, iron and ironing board, a fully equipped kitchen and all the bedding and towels are supplied. Subway, Public transport, cinemas laundrette, parks, plazas parking, supermarket, gymnasiums, banks, shops Univercitys, City Zoo, Palermo Lakes, Botanical Garden.